We still have a large number of certificates which have not been collected by students who left school in the last academic year. If you have not yet received your certificates please call into the School Office to collect them. After failing to beat Salesians on three occasions in friendlies and District League fixtures, this was always going to be a tough fixture for the boys.…so we thought! With a bit of a game plan and the boys all fired up, it did not take long for Winston to put their noses in front after starting with a very high tempo and hunger for wanting the ball. Raess Sher opened the scoring slotting the ball past the Salesians keeper early on to make it 1-0. It was with great satisfaction to see the second goal be poked over the line by Rian Anderson as the boys had been working on set pieces in training. 2-0. Winston did not take their foot off the gas and continued to cause all sorts of problems for their opposition. Looking very comfortable and still very dangerous in possession the team scored another two goals before half time. Raess Sher adding to his one goal and Carter Alcock opening his account making it 4-0. Second half the boys were far more relaxed and continued to knock the ball around very well. Salesians got themselves into the game a little more and looked a threat at times though not really testing Jack Kiddy in goal. Xav Brewer, Alfie Day and Sean Evans were taking no prisoners in defence making solid tackles and not putting a foot wrong all game. Not too long into the second half Carter showed great determination to get to goal and scored the next two goals for Winston to make it 6-0 and earn himself a hat-trick! Jordan Willis and Lewis Carey were very disciplined playing in arguably the most difficult positions on the pitch getting up and down on a very warm afternoon had superb games. Some excellent crosses and tracking back helped keep the visitors at bay. Haroon Masud and captain Chris Pateman dominated and controlled the middle of the pitch with some well-placed passes having a huge part in most of the goals. Jack Kiddy who played superb in goal made way for Daniel Swords, Jordan Willis also had a breather to give Luke Westerhold a chance to impress. The boys battled but could not prevent Salesians from scoring a consolation goal to make it 6-1. Louis Eicke and Adam Grainger replaced Sean Evans and Xav Brewer in defence to keep things fresh. Abdullah Al Tawki came on for Carter Alcock and not too soon after making an impact and scoring to put the scoring at 7-1 and the game to bed. A superb all round performance from all those involved. Not just in this particular game but throughout the season and palying a part in the team reaching and winning the District Cup Final. In recent weeks our Year 7 geographers have been set a homework task to create a model showing how layer shading, contour lines and spot heights communicate height on a map. 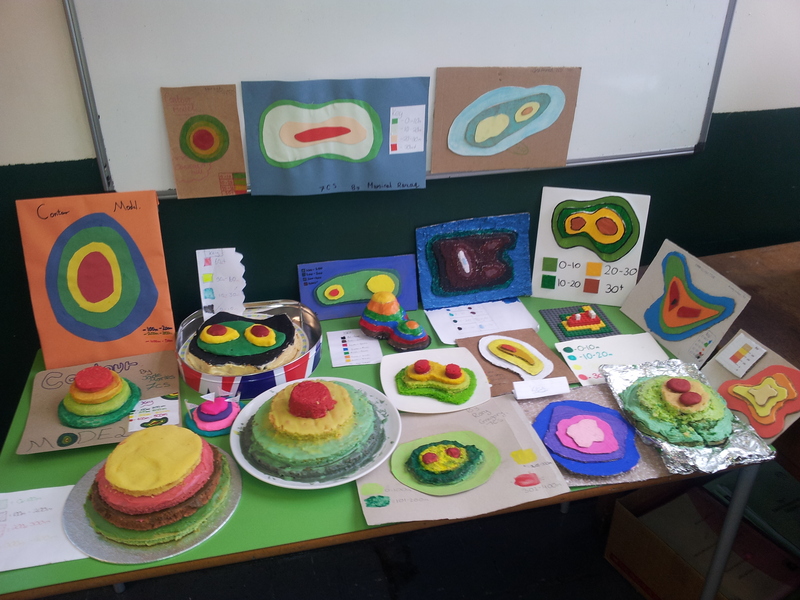 Throughout the year group we have seen outstanding work including cakes, fired and painted clay and lego in addition to more conventional cardboard and wooden models. The pictures shows the work of 7CS.